This latest mic from the respected Bock stable is as classy as it is versatile! Designed by David Bock, the Soundelux U195 is intended as a multi-purpose microphone that can handle everything from vocals and toms to guitar amp and kick drum. Its most obvious ’novel’ feature is its ‘Fat/Norm’ voicing switch; Norm offers a nominally flat response with a slight lift at the high end, whereas Fat adds a low-end boost between 10Hz and 400Hz while losing the high boost, with the intent of emulating the warmth of some vintage microphones. This is in addition to a switchable -10dB pad and rumble filter (-10dB at 20Hz). Supplied in a simple foam-lined cardboard box, the review sample mic came with a rigid stand mount, though I’d recommend using a shockmount. While aiming for high-end performance, the microphone falls into the ‘middle’ price bracket and so is within the reach of many private studio operators. Soundelux’s original U195 was in production from 1996 until 2006, after which the Bock 195 took over from 2007 to 2014. This latest Bock Audio Soundelux USA version is essentially an optimised version of those designs, and was announced at the AES show in 2016. Newly designed for this model is its large-diaphragm K67-style capsule, which is a symmetrical, dual-diaphragm, fixed cardioid design with a centre-terminated topography. Both diaphragms have a centre termination point, though only one is connected, as there’s no pattern switching. Both one-inch diaphragms are gold-sputtered, and the capsule is protected and screened by a dual-layer steel basket. Standard 48V phantom power is required, the minimum supply voltage for correct operation being 45V. Based on a proprietary low-distortion FET design, the circuitry includes an unusually large custom-built output transformer intended to maximise the low-frequency headroom. All the components are discrete and mounted on a double-sided printed circuit board, with the exception of the three switches, which have a sub board all of their own. All the polypropylene capacitors are high-quality WIMA parts and the crucial feed from the capsule terminates on a PTFE standoff, due to the extremely high impedances involved. All the resistors appear to be metal film types. The pad, high-pass and voicing switches are all located at the bottom of the mic’s body.Fashioned from brass and secured by a turned brass end cap, the body has three cutouts for the switches, which are recessed to prevent inadvertent operation. 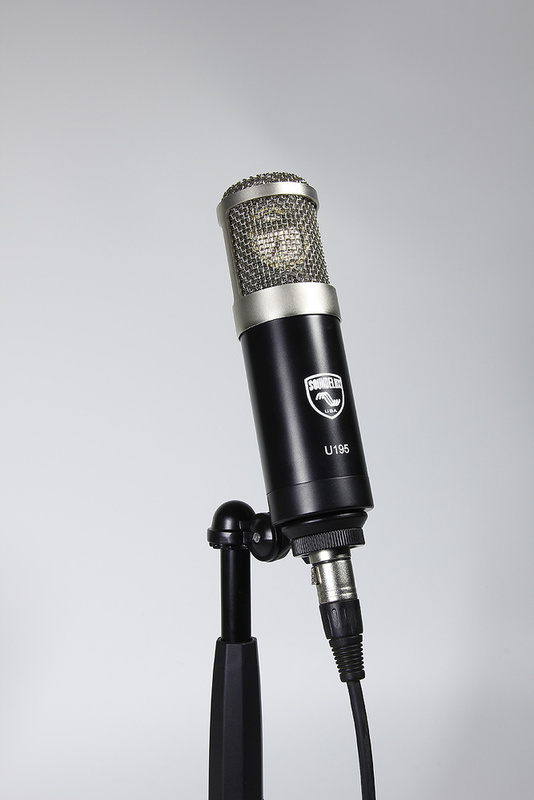 The body finish is in satin black and the serial number of the mic is engraved onto the neck of the XLR output socket. 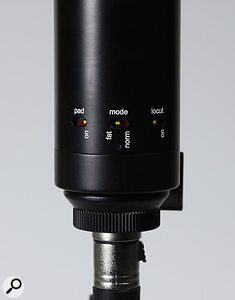 Overall the mic measures 51 x 195 mm and weighs in at 725g. Other than noise figures, it is surprising how often the technical specifications of a mic fail to correlate with the sound that we hear. This mic has a frequency range of 20Hz to 16kHz (±2dB), which doesn’t seem excessively wide given that most capacitor mics claim a 20Hz to 20kHz response, but don’t read too much into that. The mic’s sensitivity is rated at 8mV/Pa, maybe a hint lower than is typical, while the self-noise is 13dB A-weighted or 22dB unweighted — not untypical for this type of mic and quieter than some of the old classics. Without the pad switched in, the mic can handle SPLs of 126dB (for 0.5 percent THD at 1kHz). As with any capacitor microphone, once above the rated maximum SPL level the distortion increases very rapidly, and here we’re informed that it is primarily complex third-harmonic in nature. A test recording of some small bells didn’t show up any unpleasant intermodulation distortion. As a vocal mic the U195 sounds well-balanced and very smooth in the Fat voice position, while in Normal mode it tightens the lows slightly and takes on a subtle sense of air at the high end. It is good to be able to choose the most appropriate character for the voice and in either position there’s none of that mid-range ‘bark’ that some lesser mics seem to produce. Again using the Fat position, the results on an electric guitar amplifier were excellent and very much as the amp sounded in the room. I don’t find many capacitor mics that really grab me in this application, but this one really nails it. Moving over to acoustic guitar, the tone was again nicely balanced with no phasey undertones, and was detailed without sounding scratchy — so a good score there too. My final test was as a kick drum mic using my small 16-inch Tama kick as the test piece. Given the small size of the drum, the U195 fared pretty well in FAT mode with the pad engaged, though I had to use a bit of EQ to scoop out the lower mids and to enhance the beater click. That’s pretty much par for the course unless using a dedicated kick mic with the shaping already built in, though, and the final result was more than usable. Overall then the mic lives up to its ‘all-rounder’ remit and delivers quality results in all cases. 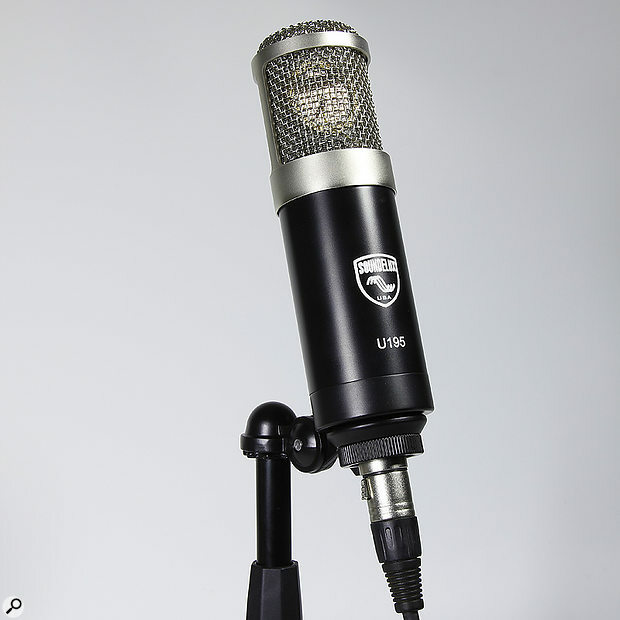 The usual caveat applies when buying a mic for your own voice (try many and see what sounds right for you), but as a general-purpose studio mic the U195 has a lot going for it. There are many competitors vying for your cash around this price, but don’t let that put you off adding the U195 to your shortlist. Pretty much every major mic manufacturer you can think of offers a microphone around this price, but that dual-voicing switch and the extra-large output transformer sets the U195 apart from most of the competition. Works well on every sound source I used it with. Lively highs without sounding aggressive. Sensibly priced given its quality. There’s nothing I didn’t like about this mic! A well-considered mid-price all-round studio mic.